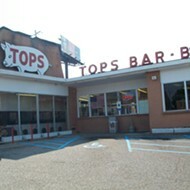 Yesterday, it was announced that a new ownership group was taking over Tops Bar B Q. Among that group is Tiger Bryant, who is behind Soul Fish and Young Avenue Deli. Bryant discussed his thinking behind the move and the group's plans for Tops. Tiger Bryant: It's an iconic brand. The primary investors [Darrell Horn and Matt Salisbury] and myself were raised on barbecue. Back when Mr. Messick [who bought the business in the 1980s] passed away, we started to make inquiries. Are you worried you're going to mess it up? No. There are no plans to change anything. The long-term employees are really part of the asset. Everybody is still secure in their jobs. What do you like specifically about Tops? It's got the natural Memphis feel to it. It's kind of old school. I think it's very welcoming, really, to all walks of life. I don't care if you're an attorney or a ditch-digger, you're just as welcome and you're going to get the same food. Was there any resistance from the family to selling? It just naturally worked out. Ralph [Horn, Darrell's father] is very tied to the financial world and they bumped into who I guess was the family trustee [and they said they were considering selling] and that just started the dance. You said you weren't going to change anything, but are you going to add to menu, maybe broaden it? We're not changing anything right now. I've had these phone calls and texts today telling me not to mess with the hamburger, don't mess with the barbecue. I'm like, guys, nothing is changing. If anything, we're going to bring some operational efficiency and try to help the stores work at the same speed of service. Do you have a particular Tops location that is your location? I grew up in Central Gardens. Like I said, I think everybody's excited. We've brought in a great team, which I think is going to bring a lot to the table. We're taking the ball and running with it, but we're not going to spike it.